The 2015 SHOT Show® got off to a roaring start this week and the first day is in the books. I’ve been battling computer problems which have hampered my ability to post updates but I do have a few quick hitters I can share from Day 1. As soon as I entered the show, I ran into the Brite-Strike booth and received a great overview of their product line from Beth and Glenn. 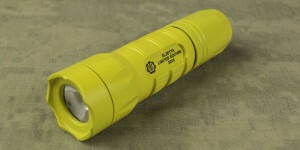 The Plymouth, MA based company manufactures a full line of tactical flashlights as well as numerous products intended to assist in law enforcement functions. One such product is their APALS (All Purpose Adhesive Light Strips) system, a nifty LED alternative to chemical light sticks that provides 80+ hours of operation. Pretty cool stuff! As I walked up on the Olight booth they were busy updating some of their display materials to reflect changes to their M18 Striker and the introduction of their latest Javelot light. The new Maverick now claims a top output of 1000 lumens and has a new side-mounted switch for mode changes. 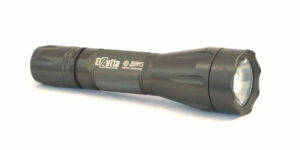 The M3X-UT is the latest addition to their Javelot series of extended range lights and also adds a side-mounted switch. I hope to be taking a closer look at this one sometime soon. David Chow with FOURSEVENS made some time to talk about his company and products, both current and future. I believe Flashaholics will be very pleased by some of the upcoming releases from the Formula Flashlight Project, a new initiative for 2015. I will write more about this after the show but, in the meantime, I will leave you with a shot of these titanium beauties designed in conjunction with the one and only PK, Mr. Paul Kim. LensLight was just a short distance away and I got my first look at their many offerings. Their lights were actually a little bigger than I expected and have a very nice feel. The special finishes available are truly spectacular. Kentucky based Elzetta Design was showcasing their new CQB dedicated weapon lights. Similar in design to the Alpha handheld light, the new weapon lights should be well suited for close-quarter activities with their powerful and broad beams. Read more about the Mini-CQB lights and a new flashlight mount for compound bows here! Tektite is another US manufacturer and is known for their handheld diving and tactical lights. Several new/upgraded products were on display including the Expedition Star, the 3xAA Trek Pro, and the 750+ lumen Excursion LS5. I’ve been checking out First-Light USA for a while now and finally had the opportunity to see their lights in person. Their Torq, T-MAX, and Liberator lines of flashlights are designed to be “hands enabling” and allow their use without interfering with tactical and law enforcement activities. I’m looking forward to taking a closer look at some of these in the future. Never content to rest upon their laurels, HDS was on hand to show the latest iterations and body styles of their flashlights. New battery configurations will soon be possible with the introduction of bodies sized for 18650 and AA batteries. Even though these lights are already among the best in the business, they are continually being improved. 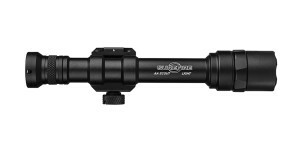 Probably the most surprising additions to the SureFire lineup this year include a variety of handheld and weapon mounted lights designed for use with AA and AAA batteries. The first to be released will be the brand new Titan-A with a MSRP of $59.99. Check out the full overview of the new 2015 SureFire flashlights for more information about the Titan and other new products. That’s it for Day 1. The doors open on Day 2 in less than an hour and there is still a lot more flashlights to see, along with tons of awesome guns and outdoor gear. SHOT is definitely an experience. 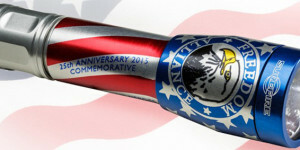 Check out the SHOT Show Archive for more information from this year’s show! 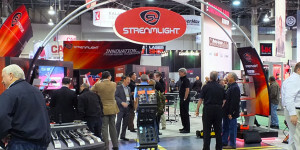 Posted in Flashlight News and tagged Elzetta, FOURSEVENS, HDS, SHOT Show 2015, Surefire. TITAN! Good thing I can’t make it to SS. I would have skipped the picture and SF would have been looking for their sample models! Joking aside, VERY excited to buy one and put it through its paces. Excellent writeup. Waiting for the PMX!